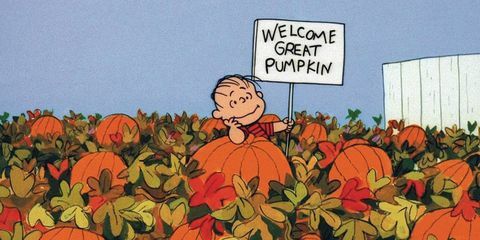 It’s not often that a whole new religion is presented in a half hour special – let alone a family cartoon — but that’s what “It’s the Great Pumpkin, Charlie Brown” (ABC, 8 p.m.) does, and has been doing for more than half a century. Only the third “Peanuts” special, first aired in 1966, when it pre-empted “My Three Sons” (It was also on CBS through the 20th century). Charlie Brown gets to say “I got a rock.” And we get to hear “Linus and Lucy,” the universal “Peanuts” dance party song. Once paired with things like “You’re Not Elected, Charlie Brown,” the cartoon gets a good companion in the the 2013 “Toy Story of Terror!” (ABC, 8:30 p.m.) which uses the favorite characters from the series for a story in a haunted motel, where the manger tries to steal the toys and sell them online. Another sign of fall: Game 5 of the ALCS, with Boston at Houston (TBS, 8 p.m.). The live exploration “Autumnwatch New England” (PBS, 8 p.m., check local listings) has its second night. “Murphy Brown” (CBS, 9:30 p.m.) is offered the first interview from a former White House advisor who has written a book. Thursday Night Football has Denver at Arizona (Fox, 8 p.m.). Annalise retries Nate’s case with an insanity plea on “How to Get Away with Murder” (ABC, 10 p.m.). Ronnie makes a surprise visit on “Jersey Shore Family Vacation” (MTV, 8 p.m.). Sam finds a clue to Dean’s location on “Supernatural” (CW, 8 p.m.). On “Superstore” (NBC, 8 p.m.), Cheyenne tries to organize a carpool to work. There’s a fight over who will host a planetarium show on “The Big Bang Theory” (CBS, 8 p.m.). “The Good Place” (NBC, 8:30 p.m.) examines the three branches of ethical thought. Morgan’s plane breaks down on “Mountain Men” (History, 9 p.m.). The twins are part of a research study on “Young Sheldon” (CBS, 8;30 p.m.). On “Law & Order: Special Victims Unit” (NBC, 10 p.m.) a member of a women’s empowerment group is found murdered. Bonnie invites Tammy to stay with her on “Mom” (CBS, 9 p.m.). On “I Feel Bad” (NBC, 9:30 p.m.), Meet tries to improve her company picture. Before there’s a wedding on “Shahs of Sunset” (Bravo, 9 p.m.) there may need to be a prenup. Ryan takes someone from the police department on a ride-along on “Station 19” (ABC, 9 p.m.). “S.W.A.T.” (CBS, 10 p.m.) helps in catching a fugitive robbing drug cargo shipments. Turner Classic Movies’ Thursday night Funny Ladies series continues with Judy Holliday in “Born Yesterday” (8 p.m.), Jean Hagen in “Singin’ in the Rain” (10 p.m.) (assuming Debbie Reynolds isn’t the funny lady in question), Doris Day in “Pillow Talk” (midnight), Lucille Ball in “Forever, Darling” (2 a.m.) and Phyllis Diller in “Eight on the Lam” (3:45 a.m.). During the day it’s all about Westerns involving stagecoach robberies: “Yellow Dust” (6:30 a.m.), “Stagecoach Kid” (7:45 a.m.), “Apache War Smoke” (9 a.m.), “Roughshod” (10:15 a.m.), “Drum Beat” (noon), “Riding Shotgun” (2 p.m.), “Son of the Border” (3:30 p.m.), “Stage to Chino” (4:45 p.m.) and “Stagecoach” (6 p.m.). Basketball includes Chicago at Philadelphia (TNT, 8 p.m.) and Lakers at Portland (TNT, 10:30 p.m.). College football has Georgia State at Arkansas State (ESPNU, 7:30 p.m.) and Stanford at Arizona State (ESPN, 9 p.m.). Women’s college volleyball includes Pepperdine at San Diego (ESPNU, 11 p.m.). Kelly Ripa and Ryan Seacrest: John Stamos, Carson Kressley, Goo Goo Dolls. The View: Jill Soloway. The Talk: Jenna Fischer, Josh McBride, Ricki Lake. Steve Harvey: Lynn Richardson. Ellen DeGeneres: Chelsea Handler, Kym Douglas. Wendy Williams: Algee Smith. The Real: Quad Webb-Lunceford, Jacqueline Walters, Toya Bush-Harris. Stephen Colbert: Joe Scarborough, Mika Brzezinski, Laura Benanti, the Revivalists. Jimmy Kimmel: Julia Louis-Dreyfus, Mike Birbiglia, Bebe Rexha. Jimmy Fallon: Jack Black, Angela Bassett, Josh Groban (rerun). Seth Meyers: John Mulaney, Meredith Hagner, Alex Ross, Daxx Nielsen (rerun). James Corden: Maya Rudolph, Nick Kroll, Nick Cave and the Bad Seeds. Carson Daly: Sanaa Lathan, Jaime Wyatt, Science Fair (rerun). Trevor Noah: Lewis Hamilton.